IMAGE BY SETH WEBER This map shows the estimated amount of illegal immigrants by state as of 2014. 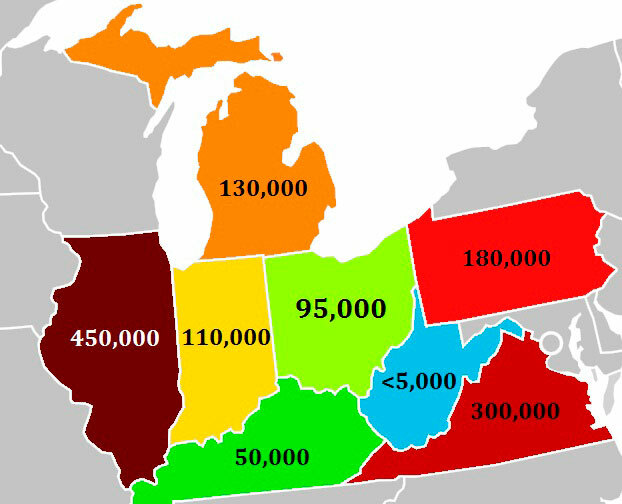 Accroding to data from The Pew Research Center, Illinois has the largest amount in the region, with an estimated 450,000 illegal immigrants, followed by Virginia with 300,000, Pennsylvania with 180,000, Michigan with 130,000, Indiana with 110,000, Ohio with 95,000, Kentucky with 50,000 and West Virginia with less than 5,000. Rhetoric concerning illegal immigration has been in the air as Donald Trump has taken the presidency, which leaves the question of how these policies could affect Seneca County. Trump has been outspoken about changing the way the U.S. handles immigration, not just to keep out illegal immigrants, but suspected terrorists as well. Illegal immigration has been a hot topic locally even before Trump took office, as protesters have been known to speak out against those detained by Immigration and Customs Enforcement. In September 2016, The Advertiser-Tribune reported on protesters gathering across the street from a Seneca County Board of Commissioners meeting. 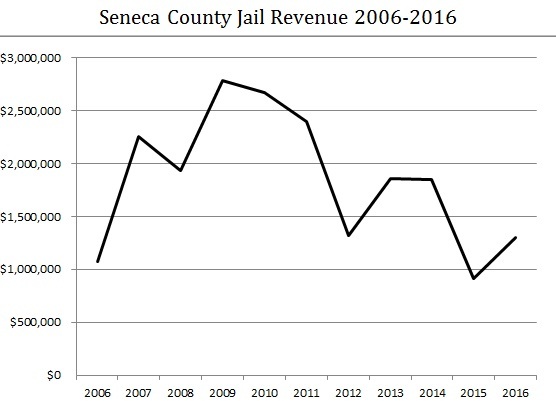 IMAGE BY SETH WEBER This graph shows revenue coming into the Seneca County Jail since 2006. A considerable amount of revenue was lost in 2015 when fewer illegal immigrants were being housed at the jail by Immigration and Custom Enforcement. This order was discussed by North Central Ohio Conservatives in February, which raised controversy locally. NCOC President Jim Green criticized the pushback against Trump’s immigration orders, saying their criticisms sounded like a “communist manifesto,” and said “lock and load, right? This is why we raffle guns,” fearing violence from protestors. Seneca County Democratic Party Executive Committee Chairman Jonathon Puffenberger responded with “outrage” to these comments. Despite this call for local law enforcement to get more aggressive on illegal immigrants, Tiffin Police Department Chief Fred Stevens said their approach towards illegal immigrants will not change. Tiffin police still will detain those whom they discover are illegal immigrants — such as during traffic stops — but will not go out seeking or investigating illegal immigrants, he said. Illegal immigrants do exist in the county, but problems involving them are few and far between, as can be attested by local law enforcement. Stevens and Chuck Boyer, unit coordinator of Seneca County Drug Task Force — METRICH Enforcement Unit, have said coming across illegal immigrants has become rare. Boyer deals with many drug dealers locally, and said most of the dealers they catch usually are from the Toledo, Detroit or Chicago areas if they’re not from north central Ohio. “It’s pretty rare that our unit directly deals with (illegal immigrants),” he said. Because of this lack of illegal immigrants, ICE has fewer to house at the Seneca County Jail. ICE, a federal law enforcement agency, uses the Seneca County Jail to detain those suspected of illegal immigration, said Seneca County Commissioner Mike Kerschner. “(There’s a) significant decrease in people being deported,” he said. The significance of the decrease rings true when looking at the federal funds Seneca County was getting from ICE for housing those detained. A report from Seneca County Auditor Julie Adkins stated revenue for Seneca County Jail housing in 2014 stood at $1.8 million. In 2015, when the number of detainees coming into the county decreased, housing revenue dropped to $917,386. Though Trump’s policies may affect future illegal immigrant arrivals and departures in the U.S., Kerschner said he’s not sure how it could affect Seneca County. “I think it’s too early to tell what Trump’s policies would do to the volume of detainees,” he said. Kerschner said Seneca County Sheriff Bill Eckelberry helped the jail make up for revenue lost by the lack of illegal immigrants by bringing in inmates from other counties. Eckelberry declined to comment for the story. This local trend also can be observed nationally, as arrivals by illegal immigrants began steadily decreasing in 2008, stated a 2014 Journal on Migration and Human Security report by the Center for Migration Studies of New York. Departures, which include adjusting to legal status, removal from the U.S., leaving voluntarily or dying, have conversely decreased. The illegal immigrant population peaked around 2008, with 12 million illegal immigrants residing in the U.S. In the following year, that number dropped to 11.9 million, with an estimated 385,000 illegal immigrants entering the country and 560,000 leaving. Seneca County Jail revenue seemed to mirror this decrease, as revenue went from $783,845 in 2005 to a peak of $2,781,421 in 2009. Revenue continued on a downward trend until it recovered slightly in 2016 at $1,302,447. The Pew Research Center reported in September 2016 the estimated number of illegal immigrants has “stabilized” and was an estimated 11 million as of 2015. The majority of illegal immigrants reside in coastal and border states, such as California and Texas. As of 2014, Pew reported an estimated 95,000 illegal immigrants lived in Ohio, which makes up less than 1 percent of illegal immigrants in the country. The Journal on Migration and Human Security report also noted fewer illegal immigrants have been coming from Mexico in recent years. As of 2012, the paper stated an estimated 120,000 illegal immigrants came from Mexico and 240,000 came from other countries. Fewer North and South American illegal immigrants having been coming to the U.S. since a peak around 2000, and illegal immigrants from Asian, African and Caribbean countries have been at an uptick, the paper stated. However, illegal immigrant arrivals from these locations have been in the tens of thousands each year, while North American immigration historically had been in the hundreds of thousands until recently. Carlos Rodriguez, network administrator at St. Francis Senior Ministries, is an immigrant from El Salvador, and has first-hand experiences with the U.S. immigration system. Rodriguez’s parents were involved in Salvadoran Civil War — a conflict lasting from 1980 to 1992 — and left the country for Mexico when he was 3 years old. He said they continued to be persecuted in Mexico 15 years after leaving El Salvador, so they fled to the U.S.
“It got really bad in El Salvador, so they moved from El Salvador to Mexico,” he said. “When you hear on the news about refugees, that’s how my parents got here,” he said. The experience was an “adventure” for Rodriguez, who did not know any English when he came to Tiffin at 18. Language was the main challenge for Rodriguez, which was made more difficult by the lack of other Latinos in the area. Rodriguez described his English education “like going to preschool,” as his learning material was elementary-level. He said children’s movies also helped him get a grasp of the basics of the language. Although St. Francis did host refugee families when Rodriguez came, Sister Jacquelyn Doepker said they’ve stopped doing so because they don’t want St. Francis to “be a target for ICE.” When St. Francis was a sanctuary campus, Doepker said, the community was “very friendly and helpful” in helping them with their mission. Throughout her years of aiding illegal immigrants, Doepker has found many of the immigrant families’ only concern was for their loved ones. “Every one of them were sending any money at all back to their family,” she said. Sister Margaret Slowick, director of Cuernavaca Children’s Mission in Mexico, has been working among Mexican families for years, and shares Doepker’s understanding of life for an illegal immigrant. Slowick said “nobody wants to leave their home country,” but she finds people feel the need to leave in order to provide for their families. As someone who is familiar with immigration into the U.S., Rodriguez does not see the point of building a wall across the border. There has not been a consensus on how much the wall would cost, but estimates range from $10 billion to $12 billion — an estimate from Trump — to upwards of $60 billion, which U.S. Sen. Claire McCaskill, D- Missouri, who sits on the Committee on Homeland Security and Governmental Affairs, estimated. Although Trump has been hopeful such a wall could stop people illegally crossing the border, research has found many illegal immigrants in the U.S. never crossed the border illegally; they simply overstay their visas, as can be seen in the Journal on Migration and Human Security report. “Far less attention and enforcement funding … has been devoted to persons who enter with nonimmigrant (temporary) visas and who overstay their period of admission or otherwise violate the terms of their visas,” the paper stated. Rodriguez may disagree with Trump’s policies, but he said practices such as separating families have been around for a while. He also noted the anger he’s seen toward illegal immigrants regarding them not paying taxes. However, Rodriguez insisted this could not be further from the truth, as illegal immigrants often pay taxes on their checks through fake Social Security numbers. “I remember people who, even if they were illegal, they were able to get jobs and they pay taxes on their checks,” he said. Research agrees with Rodriguez’s statement, as can be seen in an Institute on Taxation and Economic Policy report from February 2016. “The truth is that undocumented immigrants living in the United States pay billions of dollars each year in state and local taxes,” the report stated. Illegal immigrants pay an estimated $11.64 billion a year in state and local taxes, the report stated. This number breaks down to about $6.9 billion in sales and excise taxes, $3.6 billion in property taxes and $1.1 billion in personal income taxes. In Ohio, the report stated illegal immigrants pay about $84.8 million in state and local taxes.